Vidal Wilkinson was found guilty on Thursday (January 21) of the following charges: Possession of a Firearm; and Possession of Ammunition. He was sentenced to 3 years hard labour on each count, and the sentences will run concurrently. Basseterre, St. Kitts, January 23, 2016 (RSCNPF): One individual has been sentenced to 3 years hard labour in relation to the discovery and seizure of an illegal firearm during a stop and search operation on Saturday (January 16) in Basseterre. 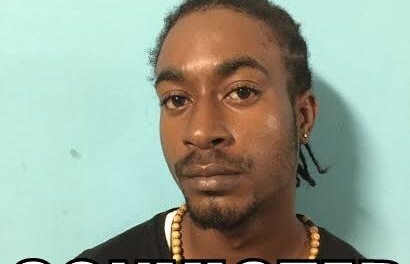 Vidal Wilkinson was one of four persons stopped and detained Saturday night (January 16) during a ”stop and search” operation which led to the seizure of one (1) 9.mm Pistol and 6 rounds of ammunition. Wilkinson took responsibility for the illegal firearm. Wilkinson was found guilty on Thursday (January 21) of the following charges: Possession of a Firearm; and Possession of Ammunition. He was sentenced to 3 years hard labour on each count, and the sentences will run concurrently. The seizure of this firearm and a conviction in this incident is another positive step in reducing violent crimes in particular gun related crimes in the Federation. Every illegal weapon removed from our streets reduces the possibility of another murder.